Most people fall in love with baseball because of its history. Some adore the timelessness of the sport. 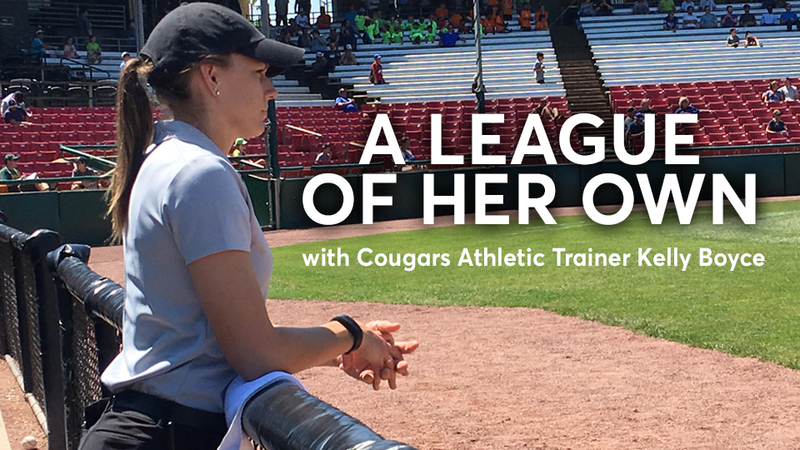 But for Cougars Athletic Trainer Kelly Boyce, it's the passion she has for the...shoulder. "As nerdy as it sounds, I'm in love with the complexity of the shoulder. It's a really tough joint with a lot going on and this is the sport where I'm going to get the most shoulder and elbow pathology", Boyce explained. For someone who didn't have much of a baseball background growing up, Boyce can't picture herself working in any other sport. She competed in gymnastics, volleyball and track at North Boone High School in Poplar Grove, Illinois, a small town that neighbors Wisconsin. But Boyce didn't join a baseball program until relocating to Arizona. Despite already being a certified athletic trainer after graduating Illinois State University in 2014, she was eager for more schooling and there were opportunities out west. Boyce received her master's degree at A.T. Still University, while also grinding away at Mesa Community College as an athletic trainer for the volleyball team and her first experience with a baseball team. Education and hands-on experience were imperative for Boyce's journey, but a presentation she attended ended up being the most beneficial. Ken Crenshaw, the head Athletic Trainer for the Arizona Diamondbacks at the time, came to ATSU to share some knowledge. Boyce absorbed every second of it. "I ended up being intrigued with everything he had to say. I got his contact information afterwards and basically bothered him for the next year straight," Boyce admitted. "I wanted to get every piece of information from him that I could and what they were doing at the Diamondbacks." What Boyce called "bothering", Crenshaw labeled as "persistence". After emailing what Boyce recalls as every two weeks, an internship opportunity arose in 2015 and Crenshaw already knew what type of worker she would be. "She had a certain passion on how to get involved," Crenshaw, now the Diamondbacks Director of Sports Medicine and Performance, explained. "Kelly showed her work ethic right from the get-go, but it's also the confident way she handles herself that makes her an easy fit." Such an easy fit that when the pool of D-backs minor league trainers had an abrupt shuffle prior to the 2016 season, Boyce was a no-brainer for the open spot in the Arizona League team staff. Moving up to Hillsboro in 2017 and in Kane County this season, it's been Boyce's confidence that makes her existence as a female so casual in a male-dominated field. Some of the best advice Boyce has received came from the Dodgers former head athletic trainer Sue Falsone, the first female to hold the rank of any major professional sports team. The two met at another one of her classes at ATSU. "She told me to 'learn the game' and to make sure I 'talk-the-talk & walk-the-walk'. If I'm able to match my knowledge of the game with my skillset of this job, then the players and coaches will respect me," Boyce recalled. Kelly Boyce isn't the only female trainer in the minor leagues. She isn't even the only one in the Midwest League, but the uniqueness of the role still bears conversation. "There's an aspect that I am proud of, but I honestly find myself forgetting about it on a day-to-day basis. It says a lot about the organization that I'm a part of and the people I'm around every day. I know I am very fortunate for that," Boyce stated. "If you want to make it work, it will work. Professionalism is always key. There are some hurdles to jump. I still always get the question of 'what is it like being in the clubhouse? ', but it's completely worth it to me in order to have the dream job that I have now." Now an Arizona resident, Boyce's summer location means a little more this year because of how close she is to home. The recent birth of her nephew, Benjamin, makes her a constant visitor of Poplar Grove, spoiling her family, especially her mother. "It's amazing to just head home on off days. It really breaks up the season a little more. I don't ever get homesick anymore and my mom gets confused with how often I am able to come home. It's been really nice." Like most people working in baseball, the end goal for Boyce is to make it to a major league dugout. Something along the lines of a coordinator position is also appealing, but for right now Boyce is focusing on embracing the journey. "I'm enjoying the grind right now and I've still got a lot to learn from people above me. If I keep doing that, then I'll eventually get to where I need to be."